Mr. Eric Ancheta teaches participants how to prepare concoctions during the training on organic vegetable production on Feb. 6-8, 2019. 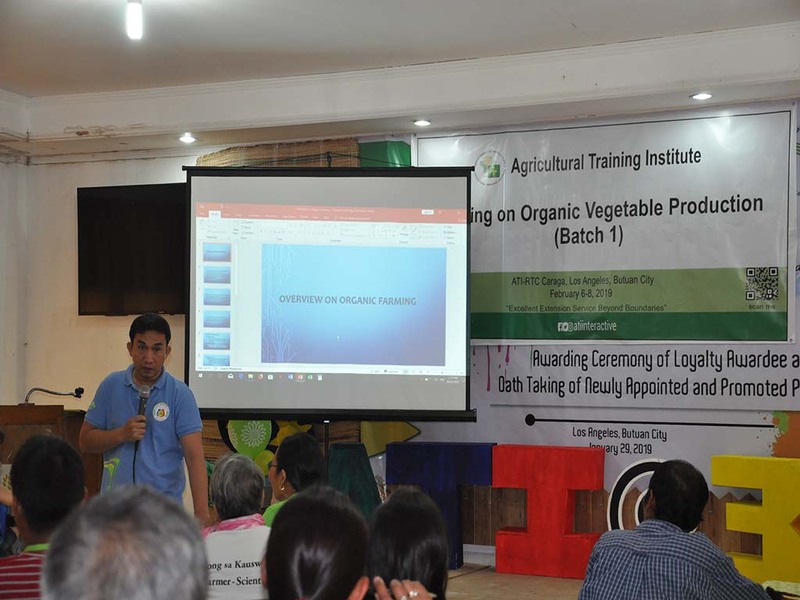 LOS ANGELES, Butuan City – Thirty (30) participants comprising farmers, Peoples’ Organization (PO) and Rural Improvement Club (RIC) members from Bacuag, Surigao del Norte joined in the training on organic vegetable production from February 6-8, 2019. With the aim of enhancing their knowledge and skills in producing organic vegetables, participants undergo actual preparation of organic concoctions right after a series of lecture. Discussion covers from the definitions and benefits of vegetable garden, principles of organic agriculture, organic fertilizer production, concoction preparation and soil media preparation. Mr. Eric Ancheta, Agricultural Extension Worker (AEW) from the City Agriculture Office of Butuan served as the Resource Speaker during the training. Participants visit Palarca and Antoquia Farms in Carmen and Antongalon, Butuan City, Agusan del Norte, respectively. These are the two (2) Learning Sites certified by the Agricultural Training Institute-Regional Training Center (ATI-RTC) 13 which are known in producing naturally-grown vegetables in the region. Said training was funded under the Gender and Development (GAD) program. This is in response to the request of the Local Government Unit (LGU)- Bacuag, SDN during the consultative meeting conducted last C.Y. 2018. The training on vegetable production is headed by Ms. Paula Mae A. Creencia as the Project Officer at the same time GAD Focal Person. Recently conducted here at ATI-Caraga Training Hall, Los Angeles, Butuan City.